Back in the days when 5.25" floppies were replaced by newer, smaller and higher capacity 3.5" disks, no one can have imagined that something invented a decade later could be so revolutionary. At less than 10% of the size of every standard floppy disks ever manufactured, adding on a capability of accommodating a couple thousand times more data with the latest models, USB thumb drives are prone to change the way everyone carries digital content. Bridging between the floppy disk era and USB thumb drive age were CD-R and CD-RWs, however, they have a large physical size, inconvenient, and worse of all, slow. When USB thumb drives were introduced, utilizing fast-arising flash memory, technology enthusiasts finally found a replacement for aging floppy disks. These little gadgets that conveniently plugs into any computer with an open USB port on board, offers a significant performance gain over floppies and compact discs, as well as boasting such a small physical size that has never been achieved before using any other portable storage medium. As USB thumb drives took over as a standard for portable storage, not a revolution -- but an evolution -- exists between generations of these tiny portable storage devices. One of the most prominent changes that we've seen over several past years can be categorized into two areas: One with emphasis on performance; with the second having a highlight on size and dimensions. 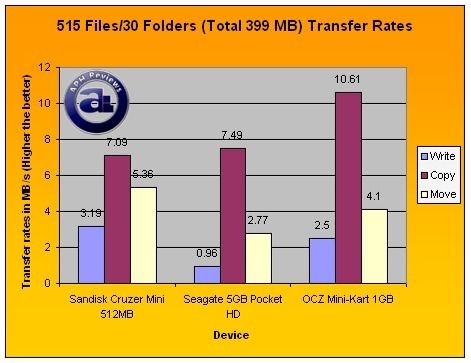 As we go over the OCZ Mini-Kart today, it's apparent that OCZ's focus on this product is not performance, but rather having an obvious emphasis on physical size. And all this can be seen by its design -- let's go over an analysis of OCZ's Mini-Kart to see if we can observe something out of the ordinary. Our review unit came in a FedEx International Priority box from OCZ's office in California. It is the same package that held review units of our OCZ 133x SD Memory in which we've taken a look at just one week ago. Our photo above shows two Secure Digital flash memory cards from OCZ in both the right side as well as the middle. Sitting on my desk at the left in orange blister-pack packaging is a 1GB version of OCZ's Mini-Kart USB thumb drive. Most of the information in regards to the OCZ Mini-Kart is displayed at the back of its retail packaging. Out of the package, you will receive the OCZ Mini-Kart itself in a small clear plastic box and a small lanyard with a key ring on one end. Our unit of OCZ's Mini-Kart used in this review can accommodate up to 1GB of data. Different versions are available for purchase; from a smaller 512MB version all the way to one that has 2GB of storage capacity. Apparently, I've never been and probably never will be a person that truly enjoys opening a blister pack. They are very convenient for retail store shelf display as well as typically having a good visual appeal; unfortunately proved to be pretty undesirable for consumers to open as the clear plastic frequently cuts my hand. Therefore, a box cutter comes in handy for opening these packages. A simple quick cut for an easy, painless removal of what you really want inside. A small lanyard with a key ring on one side is included for attachment with your OCZ Mini-Kart together with your set of keys. I can't really seem to get the lanyard through the attachment hole on my OCZ Mini-Kart, but that's alright. I store mine in my wallet; in addition to that, since this thumb drive is so small, we'd all end up showing it off to everyone we know instead. As displayed on our above photo, OCZ's Mini-Kart is not only small, but very thin as well. As it is barely thicker than a standard Secure Digital card as well as its exposed USB contacts, many may think that the Mini-Kart is an extremely fragile product. Putting our OCZ Mini-Kart 1GB between my fingers and applying a moderate amount of force with both hands, it seems to us that the OCZ Mini-Kart is pretty flexible and not easily broken. However, the part that between USB connectors and the drive itself appears to be the weakest point on this product. I used moderate amount of force instead of an excessive force to bend the Mini-Kart, since it is very unlikely for an excessive force to be applied to the Mini-Kart in real life. What's more, OCZ did not guarantee any 'rugged protection', as well as the fact that I still want to use it after this review. (To be honest, I threw it against the wall a few times out of curiosity. Not even a scratch.) Plus, you are likely to lose it before you break it -- I nearly lost my Mini-Kart three times in a day at one point! Size comparison. From top left: MobiBLU DAH-1500i, Canadian Quarter, Sandisk Cruzer Mini 512MB, OCZ 133x SD Memory, and our OCZ Mini-Kart. We were supposed to have a Sandisk Cruzer Micro U3 for comparison with this review, too bad it did not come in time due to 'corporate limitations'. For me, I don't even want to look at my Cruzer Mini 512MB after laying eyes on the OCZ Mini-Kart, since the OCZ Mini-Kart is just "that much more" visually appealing than tmy few generations old Cruzer Mini. UPDATE: Our OCZ Mini-Kart worked flawlessly for us in the first week. After a while, it started acting up; randomly malfunctioning (but occurred very rarely). Our OCZ Mini-Kart then started malfunctioning more frequently (Does not work during initial plug in). Cleaning the contacts repeatedly and re-inserting the OCZ Mini-Kart at a more 'guided' way into USB ports helped a bit. However, data corruption began. We tried our OCZ Mini-Kart on over ten Windows XP based computers and we obtained the identical results. Two days after we wrote this review, our computers can no longer access the OCZ Mini-Kart and we can confirm it defective and dead unit. Andy over at OCZ says that these are the first batch rolling off the lines and OCZ will investigate into their production as well as their quality control. The good news is, if the same happens to your drive, you should be covered under OCZ's 3-year warranty. We went undercover and sent our unit back and OCZ returned us with a brand new 2GB variant using FedEx Overnight. UPDATE 2: For all those interested in the internal components of the OCZ Mini-Kart, I took the cover of and got a photo. Offered in 1G x 8bit, the K9K8G08U0A is a 8G-bit NAND Flash Memory with spare 256M-bit. Its NAND cell provides the most costeffective solution for the solid state application market. A program operation can be performed in typical 200µs on the (2K+64)Byte page and an erase operation can be performed in typical 1.5ms on a (128K+4K)Byte block. Data in the data register can be read out at 25ns cycle time per Byte. The I/O pins serve as the ports for address and data input/output as well as command input. The on-chip write controller automates all program and erase functions including pulse repetition, where required, and internal verification and margining of data. Even the write-intensive systems can take advantage of the K9K8G08U0A's extended reliability of 100K program/ erase cycles by providing ECC(Error Correcting Code) with real time mapping-out algorithm. The K9K8G08U0A is an optimum solution for large nonvolatile storage applications such as solid state file storage and other portable applications requiring non-volatility. An ultra high density solution having two 8Gb stacked with two chip selects is also available in standard TSOPI package. UT161 is an Advanced Hi-speed USB Flash Disk Controller intended for supporting Flash memory device and pin-to-pin compatible with UT168/UT166. It provides enhanced performance at 24MB/s for Read access and 17MB/s for Write Access, and supports comprehensive Flash technologies, including Single Level Cell (SLC) and Multi-Level Cell (MLC) NAND Flash, NROM and AG-ANG Flash memory. It allows the manufacturer to improve device performance and maximize flexibility in flash decision. UT161 is a highly integrated single chip for USB2.0 Flash Disk controller, it integrates in-house USB2.0 Transceiver Macrocell Interface (UTMI), the Serial Interface Engine (SIE), 8032 compatible 8-bit micro-controller and voltage regulators. The highly integration reduces overall cost by minimizing component amount. Employed leading 0.18um CMOS technology, UT161 consumes less power thus operates at lowest temperature than all other competitors. UT161 is the most cost and power efficient solution for manufacture. In our benchmarks, we used our standard test folder to calculate performance of the drives. Our test folder contains thirty additional folders inside. Inside the folders are 515 files; consisting of EXE, INI, DAT, BIN, DLL, ZIP, JPG, AVI and more. The total combined file size is 399 MB (418,666,235 bytes). We also used a single 399 MB file (418,666,235 bytes) by adding the 515 files and 30 folders listed above to an uncompressed ZIP file for single file performance. Each test was ran at least twice to ensure accuracy. Write means copying from the test file from our test system to the device. Copy means to copy the file from the reference device to our test system. Move means to move the file from the reference device to our test system. The first series of tests is 515 files of write/copy/move. The total combined file size is 399 MB and contains a variety of different files, as mentioned earlier. Time in seconds - LOWER the better. Transfer rate in MB/s - HIGHER the better. Completing our multiple file write benchmark at 159.87 seconds, the OCZ Mini-Kart did not offer stellar performance in this portion of our tests. Translated to MB/s, 2.5 MB/s for write isn't the best we've seen so far. Hanging behind our Cruzer Mini also includes the Mini-Kart's move test results of 4.1 MB/s -- which is bested by our Cruzer Mini 512MB's score of 5.36 MB/s. When it did show performance, OCZ's Mini-Kart pulled no jokes -- the copy speed (Which is purely a read performance analysis with no write involved as it did in our Move benchmark) was completed in 37.59 seconds. In other words, 10.61 MB/s for its read performance. 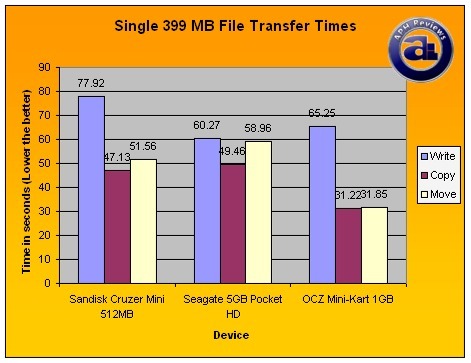 That beats our other two reference units over 3 MB/s each; giving OCZ's Mini-Kart read performance a clear lead. In our single file write performance test, the OCZ Mini-Kart obtained fairly good results. After finishing the write test in 65.25 seconds, it only stood behind our Seagate 5GB Pocket HD for 6.11 MB/s write speed versus the Pocket HD's 6.62 MB/s. However, substantial performance lead can be seen when we performed the move and copy tests -- which our OCZ Mini-Kart's indicates an impressive file transfer rate of 12.53 MB/s and 12.78 MB/s, respectively. Our HDTach results came in very close to our real-life performance analysis; indicating an average read speed of 12.4 MB/s. 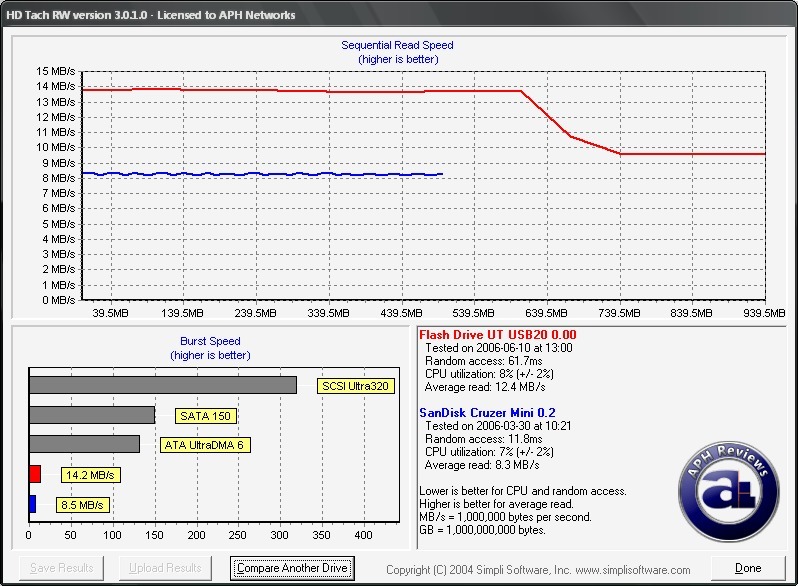 Surprisingly, random access time seems to be pretty bad with the OCZ Mini-Kart. At 61.7 ms, it didn't even come close to our Cruzer Mini's score of 11.8 ms. In addition to that, sequential read speed seems to drop significantly at the 'end' of the OCZ Mini-Kart -- something we have not seen before in a flash-based device. Usually, flash devices has very consistent read and write speed throughout all data area of the drive. I did not believe this at first, so I re-ran the same test and got nearly identical results. I hate to say this, but it's true: OCZ Mini-Kart's 61.7 ms random access score was even beaten by the hard drive based Seagate 5GB Pocket HD; which HDTach says has a random access time of 55.8 ms. On the other hand, even at the bottom of its 'big drop', read speed on the Mini-Kart is still faster than both the Cruzer Mini and Seagate 5GB Pocket HD. 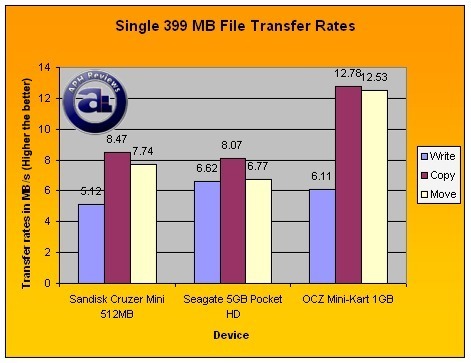 UPDATE 3: It has been reported by APH readers that the OCZ Mini Kart 2GB gets really low results in HDTach. We used our 2GB warranty replacement we got from OCZ, completed a HDTach read test and we obtained similar results (Average read under 1MB/s). This is likely to be a design flaw and we won't recommend you to get the 2GB variant at the time until this problem is addressed by OCZ. Given its impressively tiny physical size of having a surface area roughly the same as a standard SD card, I can confidently say without a doubt that the OCZ Mini-Kart is worth showing off just for this. Being impressively small and thin, the OCZ Mini-Kart is definitely not fragile. Despite its less than spectacular random access time and relatively average write speed, our OCZ Mini-Kart obtained excellent results in APH Networks' read tests. Combined with its incredibly low price of approximately $30 at our local retail stores, just... wow. In conclusion, if you are looking for a downright tiny USB thumb drive with a rock-bottom price tag from a reputable manufacturer, look no further than the OCZ Mini-Kart. Special thanks to Andy over at OCZ for making this review possible. Note: The number ratings below has been adjusted accordingly to comply with our new Number Rating System. Absolutely tiny USB thumb drive that performed very well in our read performance benchmarks. Write speed can be improved; but the OCZ Mini-Kart comes at a price tag you simply cannot resist the urge for an immediate purchase. posted 6 hours and 6 minutes ago, with 56 posts.